A few days ago, it was reported by Al Jazeera English that Muslim authorities in Malaysia seized 300 bibles written in the Malay language because it contained the name 'Allah' as a translation of the English word 'God'. I don't know if this was the best course of action but after months of observing the development of this conflict (if I may call it that) this is my conclusion: The problem is not that we disagree with each other but the way we choose to express our disagreement and how it is represented by others. Before I continue, I'd like to say that I'm writing this out of love and respect for my Christian friends and brothers and sisters in humanity, many of whom I personally admire and care about. I also want to express my reservations about publishing this post and making quick conclusions regarding this issue. I'm not a scholar of Islam, theology or history. Having said that, I've formed a personal opinion based on my knowledge at this point of time after doing some independent study and my friends have asked me to write about it. I'm not here to assert my views for the sake of being assertive. However, I would like the opportunity to help clear the air a little because the media (especially social media) has represented the 'Allah' issue as a Muslim vs. Christian battle which I believe is inaccurate and provocative. And yes, the Malaysian government (central and state) is partly to be blamed for that. However, saying things like 'We are laughing at you' or 'Our politicians are ignorant, unschooled and yet proud to do so' is hardly helpful. It's time we ask ourselves, "What are we doing or saying to improve the situation?" 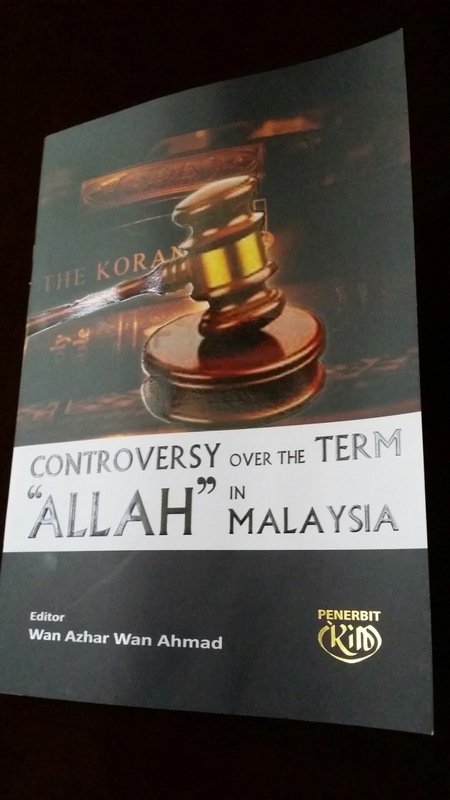 In effort to understand the authorities' decision I have read a booklet published by IKIM which comprises of four essays by Malaysian Muslim scholars in defense of the Malaysian court ruling against the use of 'Allah' in the Malay version of the bible. I have also analysed dissenting views by Muslims and non Muslims in the form of news articles, scholarly lectures and videos to have a more balanced understanding of the issue. Though objectivity is not easy to achieve it is worth an attempt. As a result of my observation and careful consideration, I'd like present two factors in this discussion: (1) context and (2) the integrity of meaning and language. Context: Is 'Allah' the Arabic word for 'God'? Currently, the two official languages of Malaysia are Bahasa Malaysia (Malay) and English. The Arabic language, along with Islam, was introduced when Muslim Arab and Indian traders, many of whom were scholars of Islam, visited Malaya sometime in the 13th century. Hence, in Malaysia the Arabic language is synonymous with Islam. I don't know what transpired but a memorandum concerning Islamic terminology dated in 1986 was found. It stated that the Cabinet at the time had decreed four words cannot under any circumstance be used in the bible: 'Allah', 'Kaabah', 'Baitullah' and 'Solat'. I'm curious to know what led Malaysian Christians to adopt 'Allah' as the name of God in the Bahasa Malaysia (Malay) version of the bible, particularly in Borneo (Sabah and Sarawak)? I personally don't mind when my non-Muslim friends say "Allahuakhbar" (Allah or God is Great) or "InshaaAllah" (Allah or God willing) because I know they mean well. How do I know? I look at the context these phrases were used - they innocently used these phrases while interacting with their Muslim peers. However, as a Muslim, I do feel it is inappropriate and blasphemous for 'Allah' to be used in the holy books of other religions in places where Arabic is not the mother tongue of the community, because even though I believe Allah (swt) is the Rabb (Lord and Sustainer) of all people regardless of their faith (or lack of it), the application of the word or name 'Allah' in authoritative books should be done in the correct manner out of reverence for Him. If we are taught that it is respectful to spell people's names correctly and address them appropriately then shouldn't we use the name of God carefully too? If non-Muslims are not aware of this it isn't their fault. It is the responsibility of the Muslims to inform them. For example, if an innocent child were to bring a teddy bear to me and call it 'Allah' I would nicely correct him or her simply because it is inappropriate to refer to anything else other than God as 'Allah' out of love and reverence. This is the reason why I feel it is inappropriate to use 'Allah' in the Malay-version of the bible but I'm not condoning those who feel they have the right to enforce this belief on others. I'm only suggesting that people should be aware. I don't believe Malay Muslims will convert to Christianity because of the use of 'Allah' in the bible and I'm not accusing Christians of proselytisation. Muslims have left Islam for various reasons. In the Islamic line of thought, we say it is because their iman (trust and faith in Allah), aqeedah (belief in Allah as the One True God) and understanding of tawheed (Oneness of Allah) have been compromised due to several factors, such as the encroachment of secularist principles in our values and way of life. The real threat to Islam is not Christianity, Judaism, Hinduism, Buddhism or other religions. If you've read Professor Syed Naquib al-Attas' book Islam and Secularism you'll see secularism has not only affected Islam but also Christianity. This leads me to my second subject in this discussion. Secularism is not just the separation of religion from the state or the desire to exclude religion from public life. Secularisation is a process which has affected the integrity of meaning and language, amongst other things. For example, Hebrew, Aramaic and Greek (the original languages of the Old Testament and New Testament) are not strongly emphasised as the main language of Christianity and Christians themselves have professed translations don't do justice to these sacred texts. Whereas in Islam, this has been countered by making it obligatory for the Arabic language to be used, especially in daily prayers, because it's the medium in which the Qur'an was revealed. Without preventing people from reading translations of the Qur'an or making supplication (dua) in other languages, we also believe there is great blessing in studying and reciting the Qur'an in Arabic and this partly because it maintains the authenticity of the message - literally, figuratively and phonetically. The same is done in Judaism but with Hebrew. To maintain the integrity of Christianity and biblical studies, why don't we use the name 'Yahweh'(YHWH) to refer to God in the Malay bible? After all, that is how it was written in the Old Testament and New Testament. Wouldn't it be better for biblical studies to incorporate as much of the original texts as possible? Until today Pastor Lawrence Andrews insists 'Allah' should be used in the Malay bible. I'd like to know if there is a religious reason why Malaysian Christians should emulate the language of the Arab Christians? Based on my understanding, there is no reason to think that the word 'Yahweh' is unsuitable compared to the word 'Allah'. If you disagree, I'm more than happy to learn about your point of view. I don't know if seizing copies of the Malay bible was the best course of action or if it's fair to keep saying Malaysian Muslims say 'Allah' is for Muslims only. No, Muslims do not have the exclusive right to use 'Allah' and that's not what Malaysian Muslims should be advocating. However, if the name of God, 'Allah', is not used in the best manner (according to the description of Allah in Surah al Ikhlas) then yes, I feel it is inappropriate and we should have an interfaith dialogue about it. It is a matter of the integrity of meaning and language. A solution will emerge when all parties are willing to engage in a discussion about this openly and respectfully without getting riled up by emotions. But it must be done with the intention of finding a solution. Perhaps representatives of the Malaysian government and the Bible Society of Malaysia have discussed the situation but we are not aware of it. Nonetheless, we should educate ourselves because in our move towards a more inclusive and democratic society we should do what we can to foster good relations between adherents of different faiths. I may not agree with those who are adamant about using 'Allah' in the Malay version of the bible but I don't agree with the manner of the media and Malaysian authorities in handling the controversy. Although I don't think the 'Allah' issue should be trivialised, I do believe there are more serious causes of apostasy and that's what Muslims should be paying more attention to the most apart from the development of Muslims - socially, economically, intellectually, and so on. There's a saying of Prophet Muhammad (peace and blessings be upon him) I'd like to share: The deen (religion) is naseeha (advice). In the midst of arguing who's right or wrong we have forgotten that one of the basis of Islam is to create ease and peace in the community in by advising one another towards good. And with that, I hope more Malaysians will understand this is not a fight against Christianity. It's an issue of integrity which needs to be dealt with integrity, mercy, adab (good manners) and respect from all Malaysians regardless of faith. This is an opportunity for us to rise and do something positive for our community and religion. It's an opportunity to be exemplars of what our faith has taught us. As the saying goes, "There is a crack in everything. That's how the light gets in." Finally, to reiterate my point, the problem is not that we disagree with each other but the way we choose to express our disagreement and how it is represented by others. I apologise for the lengthy write-up. If I have offended anyone with this post please forgive me as it was not my intention at all. If you disagree with any of the points I've raised here please feel free to correct me. At the end of the day, I find peace in knowing that my opinions or arguments are not necessarily correct or the best and in believing that Allahu'alam (God knows best). Brilliant article, Sha. Gonna share this! I am Muslim from Sarawak. when you mention the first misconception, i am rather surprised by it. Ilah is kata nama am. Allah is kata nama khas. written in English as god (kata nama am) and the God, (kata nama khas). Historical-wise, in Hebrew scripture, the original bible, the word Allah is used, as in the God. when Bible translated into Malay, which is enriched with kata pinjam, the use of word Allah is maintained. not translated. it is maintained, not translated. there are a lot of source in comparative religion if you are curious. My bad of using Malay as English is not my strong point here. 1. Isu kalimah Allah telah dimenangi oleh umat Islam dengan keputusan mahkamah pada 14 Oktober 2013. 2. JAIS mempunyai hak merampas kerana dari segi undang-undang memang dibenarkan. Golongan politik sengaja menghangatkan isu ini. 4. Murtad. Saya setuju dengan pandangan Puan dalam hal ini. Penggunaan kalimah Allah tidak boleh menyebabkan umat Islam murtad. 5. Keliru. Penggunaan kalimah Allah oleh pihak Kristian hanyalah untuk mengelirukan umat Islam. Mungkin pada generasi ini dan dua tiga selepas kita masih lagi kita pertahankan perbezaan haq dan batil. Tetapi adakah kita boleh pertahankannya setelah itu? Contoh terbaik di Indonesia. 6. Jatidiri. Ia tentang ketegasan umat Islam dalam isu akidah. Penggunaan kalimah Allah oleh pihak bukan Islam berkait rapat dengan isu akidah. Seperti yang Puan nukilkan, akidah Islam memang mempercayai bahawa itu sendiri adalah nama Tuhan yang khusus iaitu Tuhan yang Esa. Pihak misionari cuba menganggu gugat kepercayaan akidah umat Islam. Kesimpulannya, umat Islam di Malaysia mempunyai hak untuk mempertahankan kalimah Allah. Hujah bahasa dan syarak telah diberi namun siapakah yang tidak ingin mendengar? Pihak misionari masih ingin menimbulkan huru hara dalam keadaan umat tersepit dengan agenda songsang golongan Liberal (Sister in Islam, Islamic Renaissance Front etc. ), Syiah, Sekularisme, dan Hendonisme. Solusinya? Kembali kepada ajaran Islam yang sebenar. Kembali kepada al-Quran dan Sunnah. Penafsiran al-Quran dan Sunnah seperti yang salafus soleh (para sahabat, tabiin, tabi'tabiin tafsir). Might I add: I don't agree with seizing bibles from churches. I think that's a forceful and against their will. I don't think this is a merciful and diplomatic enough approach and it paints such a scary image of Muslims. Such a bad approach. Peace to my Christian brothers and sisters. I was told by a Christian friend that YHWH is not generally used by Christians because it is the proper name of God and thus it shouldn't be uttered. 1) Do Malaysian Christians want to use 'Allah' to help Malay-speaking Christians? 2) or do Malaysian Christians want to use 'Allah' because it was done by previous/other Christians? My intention for writing this blog post was not to tell Christians what's the best way to address God but rather to explain the sensitivity behind the issue. And most importantly, to show people we can have a discussion about this in a civil manner without calling anyone names or accusing anyone of malice. If it is not a translation but a way of maintaining the original text, why use 'Allah' only in the Malay bible but not in all bibles, in all languages? Regarding their intention, I can't answer it for them. About why not all bible, maintain the same languages, i have few knowledge about it. I hope there isa fellow Christian that can explain further. In Christian, there is Protestant, Catholic and several others. Their take in God also different. There are those who pray to Mary and there are those who didn't. For those who venerate Mary, they have the trinity concept of God, there are Jesus, Mary and Allah. Bible itself, has been translated many times, and the word Allah has been used and not used throughout the history. If i am not mistaken, National Geographic has an edition about how many time Bible has been translated and how many version of translation exist till this day. My knowledge is limited to this end of why there is Allah in Malay translated Bible. Sha, it is very nice to have such discussion. I beg the differ; I don't think the world Allah is used in Hebrew scripture. The four letter word (YHWH) is the one that appeared most as the name of God in the Hebrew bible, usually translated as Lord in English bible. Another common name in Hebrew bible is also Elohim. Not sure when Aramaic was finally translated to Arabic but I wonder how the word Allah got to be there. The other thing is, when Bible was translated into Malay, assuming it was translated from English (might be from German or other European language since there are European missionaries in Borneo), how did the word Allah was maintained as I don't believe the word Allah exist in the English bible? If there're only God / Lord / Father in the English bible depicting God, why not use just stick to the Malay world "Tuhan" or "Bapa"? This is why I'm rather suprised when you stated, when the bible translated into Malay, the word of Allah is maintained. I agree with you, there are a lot of source in comparative religion if you are curious. I apologize for the poor explanation how the word Allah appear in Hebrew scripture. If i am not mistaken, I am rather rusty in this area, the term sister language is used here. I don't have any hard reference here, only memories. I recall the key is from how holy scripture are written, language-wise. From one scripture to another. From Torah, to Bible. Both are different book, but throughout history, they maintained their believer, which described in Quran, as the People of the Book. One need to remember that word are tools to convey information. Despite the definition given in the dictionary, language is a social byproduct. It changes according to the society. Instead of looking this issue in bottom-up perspective, why Borneo have it, not other part of the world, I found the answer looking from the bird eye view perspective. I am sorry I did not offer much help here. In case i recall the whole journey of which other Bible use Allah, who used the word throughout the history, Ill get back to you. in Christian, there is difference segment, Catholic, Protestant and others, i can't answer exactly match what with what. (definitely rusty here), some call their priest, father, some call them priest, some call them minister.This is a result of their belief. And their belief depends on how the scripture translated. In their Trinity God concept,there are three entity, the first is Jesus, Tuhan Bapa, and the second, is Mary, the third, the other God is 'the God', hence the word Allah. I hope in the process I have not offended anyone and in case of false information, especially about Christianity,I apologize in advance, and I hope someone will corrected me in time. Just a quick comment: I didn't write this post to defend Islam because this isn't a Muslim vs. Christian debate. I wanted to explain the stance some Malaysian Muslims have on the issue and show people that we can talk about this without getting too emotional or too defensive. If we talked to each other instead of posting rude comments or statuses on social media, it would be far more beneficial. P.S. Dear readers, I welcome counterarguments but please keep your comments RELEVANT to the issue. Thank you. I'm a Christian from Sarawak this is my view. I wish to correct Anon point #3, #5 & #6. Point #3, we wish to practice our religion in peace. It is a basic human rights & if we don't defend it then who will? Our teaching did not meant to confuse other religion be it a Muslim, Buddhist or Sikh. The Christian movement focus a lot on prayer, fasting & giving, not confusing other people. Point #5, again, the use of 'Allah' in our bible is not meant to confuse the Muslim. The word 'Allah' has been used in the Bible for more than 400 years & I never find the word being used to preach on the Muslim. Malaysia cannot be compare with Indonesia in term of religious freedom. In Malaysia, it is ok for a Christian convert to a Muslim but not the other way around. Point #6, the use of word 'Allah' in Christianity has been long use before the existence of Malaysia & even before the existence of Islam itself. I've been attending lots indirect/direct Islam teaching in my life but I never find it confusing my religion. I've been asked to pray together with Muslim children during my kindergarten, listening to tabligh teaching, attending TITAS (Tamadun Islam & Asia Tenggara) during my University time but I never feel its offensive or threatening to my religion. I took it as part of my education & I believe that there are others (Buddhist, Hinduist, Sikhs) who had the same growing up experience like me. If we can coexists/tolerate with Islam teaching in our life, then why can't you? What really puzzled me is why certain politician, leaders & Muslims view the word 'Allah' in our Bible as threat? Why take it as a threat now? In conclusion, every human has their rights to practice their religion in peace & harmony with other religion. Despite all the protests, threats & accusations, we choose to remain calm & believe that justice will come. I believe God is the most just, most forgiving & most merciful. Thank you for raising some valid points and questions. 1. You are right. Christians must be able to practice their religion in peace. There's no debate about that. To my understanding and observation, Christians have always been able to practice without any problems in Malaysia -- until the 'Allah' issue was raised -- and if I am not mistaken it is only the Christians in Borneo who use 'Allah', yes? I was not aware Christians in Borneo have been using 'Allah' in the bible until this issue became publicised and politicised. I was surprised because none of my Malaysian Christian friends have ever mentioned it before. My guess is that they were probably not aware themselves. Again, as you said, practicing Christianity is so much more than what the video has described. I don't feel threatened by Christianity and in fact, I enjoy learning about it because we are part of the Abrahamic faiths. But this could be because I was partially raised in New Zealand and have a different outlook towards approaching certain things. As you said, you can attend Islamic events and feel it hasn't shaken your faith at all. That's how it should be with Muslims when it comes to people of other religions too. 2. Just as Christians are free to practice Christianity, they are also free to propagate their religion in Malaysia. However, as I explained in my blog post, Arabic and Islam are synonymous in Malaysia. This is where it becomes a sensitive issue. Using 'Allah' in the Malay bible in Malaysia is as awkward as using 'Jesus' in the Malay Quran. So what do we do now? As a Muslim, I don't have the right to take away your right to use 'Allah' in your worship as it is a practice that has become embedded in your daily life and culture. I do think the usage of 'Allah' by Borneo Christians or Indonesians was acculturised more than anything else because if you were to attend a church service, say in America or Italy, you wouldn't say "I worship 'Allah'" but instead say "I worship God or Jesus." Now, since I don't believe in making it illegal for 'Allah' to be in the bible the least I can do is explain my stance and educate people about who Allah (subhanahu wa taala) is to Muslims and why we find it blasphemous to associate him with the Holy Trinity. If you feel connected to God through the name 'Allah' I pray you will continue to find solace in His name. Until today, not a single Christian has explained to me why 'Allah' should be in the Malay bible instead of 'Yahweh' (YHWH). 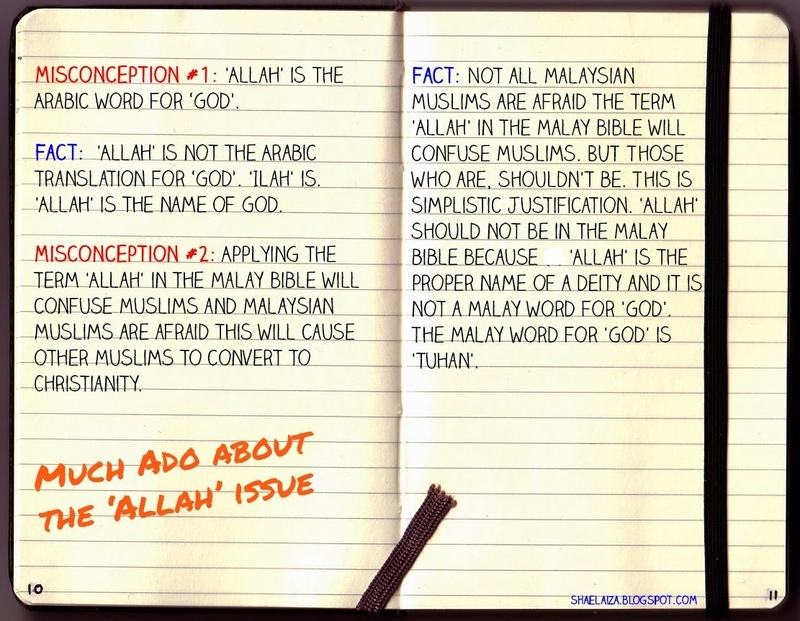 Or why 'Allah' was used in the Malay bible in the first place even though it is not a Malay word. Is there a religious reason to use 'Allah' instead of 'Yahweh' (YHWH) that I am not aware of? Is there a religious reason to emulate Arab Christians? I am truly seeking answers and I am sure others are too. 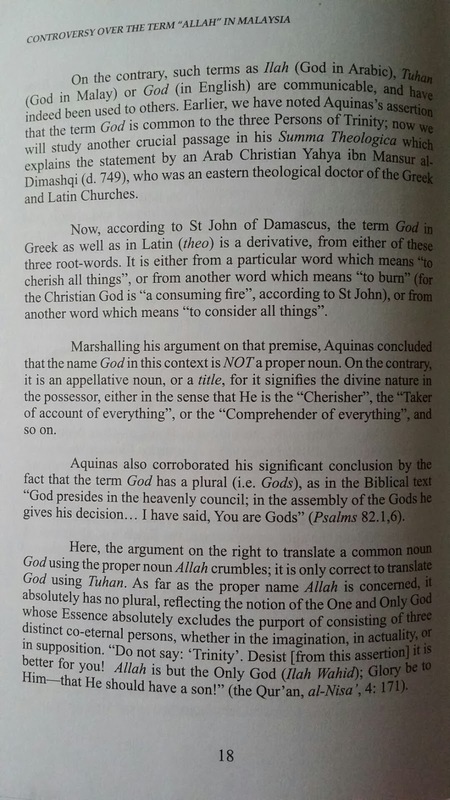 Until today, not a single Christian has explained to me why 'Allah' should be in the Malay bible instead of 'Yahweh' (YHWH) *apart from the fact that it is said to be God's proper name and thus it is inappropriate to mention it. As told by a Christian friend from New Zealand.